I think from the above things you might have understood and got a sense of the term Flipper and let us know why it is used in Leg spin. Flipper in cricketing terms is nothing but simply it is the name of quicker delivery in Leg spin bowling . It is completely different from normal leg break where as the leg break bowling is much slower than Flipper ie Leg break bowling speed normally ranges from 70 to 90 or 70 to 95 kmph where as the Flipper ranges from 95 to 105 or 95 to 110 kmph. It is straighter and doesnt lift in air too much. Its speed is higher compared to other deliveries like leg break ,slider,Topspinner etc. It is the best weapon for , to completely shatter the Tail Enders . So why it is not only quicker but also sudden ? It is also sudden because the time gap between After pitching and before hitting the bat is totally completely less compared to Normal Quick deliveries . It is very difficult to bowl a Flipper in Line and Length . It mostly pitches in short lengths and there by making the batsmen to pull the ball and hit for a six or a four. Now a days Good batsmen are recognising the Flipper very well so there fore you have to be pre planned depending upon the batsmen . And , so you have to bowl it in right line and length (The mostly in Length). That means you shouldnt bowl it shorter but maintain it always it in good Fuller Length. (And maintain the basic continuous Leg break bowling and then sudden change to Flipper gives the result what exactly you needed and makes the batsmen no time to , not even to think). 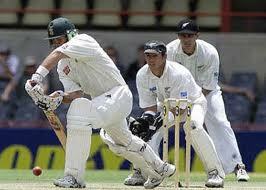 Mostly these Flippers can be seen in the Great bowlers like the Greats Shane warne and Anil kumble . And significantly Shane warnes Favourite ball was the Great Flipper . In 1996 WC in semi final , in the match between WI and Aus ,where the WI could have easily win it , but the Great Shane warne has completely shattered the Tale Enders with his Great Flipper and most of them were LBW’s . The West Indian Batsmen not even couldn’t understand what was going on . And the Great man had done it in Great style . Generally for a spin bowling the good length ranges from 2 to 6 yards, but where as for the fast bowlers it ranges from 4 to 8 yards. The simple reason is pace of the spin infact the speed in understandable language. The speed of the spin (70 to 95 kmph) is less compared to fast bowlers (110 to 160 kmph) , so what happens here is if you bowl it in between 6 to 8 yards (Good length for Fast Bowlers) with the speed mentioned above since ,as the pace is slow it gives ample of time for the batsmen to pull it ,cut or to drive it. 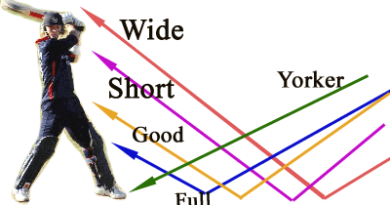 Here the significant thing implies is, the speed of the spin doesnt support the length ranging from 6 to 8 yards and more over becomes more slow before hitting the bat and even turns , then making the batsmen much easy to cut and pull. As we know the Flipper is the greatest weapon for leg spin bowling, but if this Flipper is bowled shorter in length then it becomes the worst delivery than any one. Because once you have bowled it in short length i.e above 6 to 8 yards, since it is straighter and quicker the good batsman always can easily pull it for a six or a four. 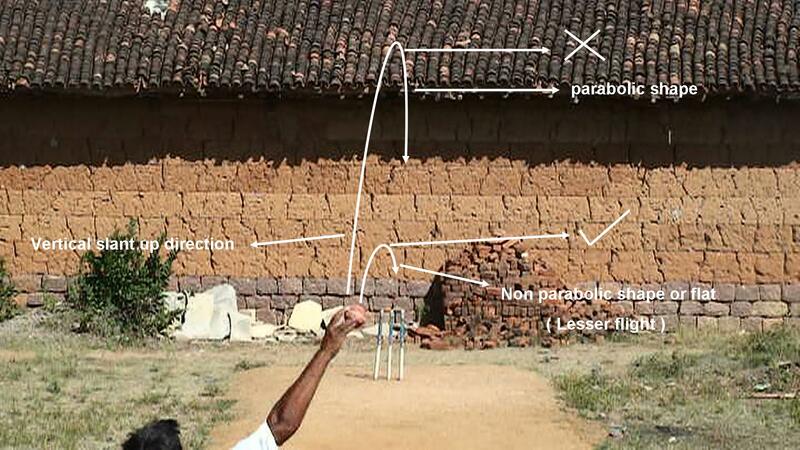 So you can easily understand here how the length is very important for this Great delivery. The atleast length for Flipper has to be maintained between 4 to 6 yards. And I can assure you that the even more good length for the Flipper could be easily 3 to 5 yards or 2 to 5 yards (which is little bit fuller). These lengths mentioned above gives no time for the batsman to or not even to think (definetly they will be shocked). From the above you have to understand the Flipper has to be always maintained in good length and little bit fuller length (2 to 6 yards). Now let us know the difference between the Flipper and Normal quick delivery (Dont get confused you will be understanding very soon). If we compare the quicker delivery in Normal or Fast bowling with the Flipper (sudden) we get a thin line making the difference between them. Let us understand the concept behind it. 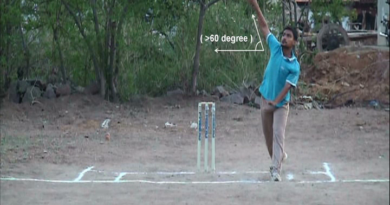 In Normal or Fast bowling when you bowl you can notice very carefully the hand or higharm, Wrist and fingers (fore and middle) will be behind the ball with the seam at the time of releasing point.The thing here we need to understand is the concept behind the rotation of the ball. So when we bowl normally the ball rotates in south direction with the seam after released from hand. After pitching it becomes slower before and while hitting the bat. That means there is a difference in speed from releasing point to before hitting the bat. Let us say that speed difference be some ‘x’ value (Lesser the speed difference the more quicker and sudden). So now when you bowl Flipper you can notice very carefully the Wrist will be on left side of the ball and fingers (fore and middle) will be on top of the seam (across) at the time of releasing point. At that scenario when you observe the rotation of the ball very carefully the direction of the ball will be in North i.e the ball rotates in North direction with the seam at the time of releasing point (i.e after releasing from hand). Here also after pitching it too becomes slow before and while hitting the bat, But let us now come to the, the big thin line difference between Normal quick and Flipper. 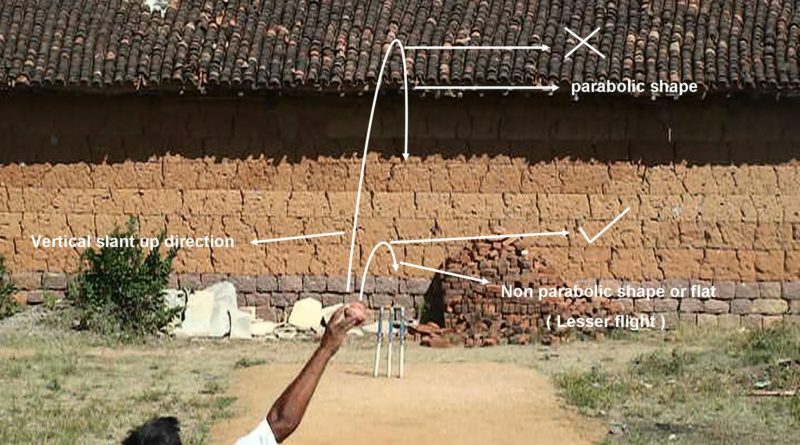 As we know from above explanation in Normal quick bowling the ball rotates in South direction with the seam straightly and said that the speed difference of the ball between the releasing speed and before hitting the bat would be some value ‘x’. But in Flipper if you bowl with the same speed, as the ball rotates in North direction with the seam straightly the speed of the ball will be more and more after pitching compared to Normal quick delivery. Since the ball rotates in North direction the seam of the ball pushes with more force after pitching (compared to in Normal quick delivery) and there by decreasing the speed difference between the releasing speed and the speed before hitting the bat. This implies the speed difference in Flipper will be much lesser compared to value ‘x’ (as we said in Normal quick delivery). So here the important thing is the speed difference between the releasing point and before hitting the bat. The lesser the speed difference the greater the quick and sudden. The more lesser the speed difference the more sudden and quicker. Ofcourse both the Normal quicker and Flipper are quicker but the Great Flipper is more sudden compared to Normal one (Due to less speed difference). You cannot use the word sudden for Normal quick deliveries (For the same speed of testing). At last due to its less speed difference and rotation of the ball (North direction) makes it sudden and hence we use the word FLIPPER (Flip= sudden movement) rather than compared to other quick deliveries.